When we hatched out a batch of chicks last summer, one of our goals (besides replenishing our layers) was to obtain a second rooster. This is Snap, our faithful male. We hatched him from an egg four years ago. He's been an excellent rooster -- virile but easy on the ladies, and never aggressive to us. Even after four years, he's still going strong. But as much as we like good ol' Snap, he's getting up there in chicken years. 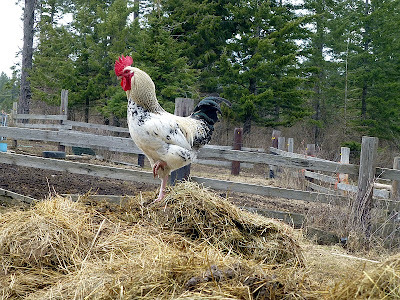 Besides, with 18 hens, we need a second male to make sure the eggs are fertile (a good ratio of roosters to hens is about ten hens to every rooster). Two years ago we hatched a beautiful white rooster whom we named King. Sadly, King got carried off (presumably by a coyote) last summer, leaving Snap once more our solo male. So as I said, one of our goals with hatching chicks this past summer was to get another male. As usual with straight-run hatches, about half our results were young roosters. After some observation, we culled all but one, a lovely young black male with cute little cheek patches (proving him to be part Americauna). I named him Tarzan because his early crowing attempts -- no exaggeration -- sounded just like the old TV character. Frankly he sounded pretty pathetic. He's improving, but so far is nothing like Snap's virtuosity. Right now he's about one-third the size of Snap, so he has a lot of growing to do. We also tuck him in the inner cage of the chicken coop at night lest he get the tar beat out of him (dominance issues, doncha know). But little Tarzan seems good-natured and (ahem) extremely virile. We've noticed that while Snap dominates Tarzan in the coop, he pretty much leaves him alone while outside. This shows Snap is starting to slow down with age. He's still healthy and strong, but less threatened by another rooster's presence. Such is life. The best Christmas present that our son ever gave us was an Ameraucana. I had no idea that a chicken could be that pretty. Her feather colors were just stunning. We are on our 3rd one now weasel and hawk got the others. I also love the light blue eggs. Yours has the iridescent colors like a turkey. Very pretty bird. Why do you desire fertile eggs? It would seem fertilization would only be important once a year if you wanted to hatch chicks. We have 25 hens and no rooster and receive just under 2 doz eggs a day. Why do you want your girls fertilized at all times? When we want to raise chicks we borrow a rooster for a week and separate two broody hens to raise chicks. Works every time. 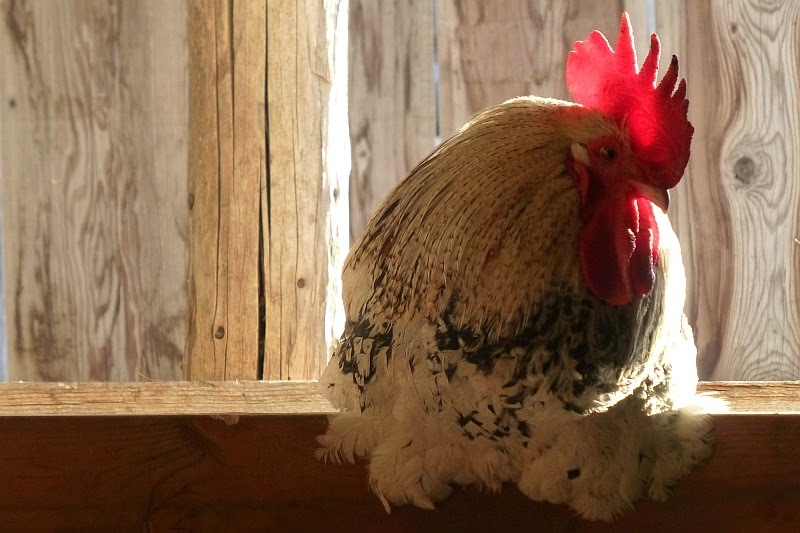 Roosters are not just for fertilization. They also instill order in the flock and security which in turn means calmer hens and better egg production.... Hens feed more while roosters are watching over the flock for predators, resulting in better production.